Crème brûlée is all about that crispy, sugary crust right? Sure, the silken custard underneath is good too. But thin shards of golden, caramelized sugar that shatters upon the very first whack of a spoon is what draws you in for the win! (We’d probably brûlée a lasagne if we could). So, how about this instead? 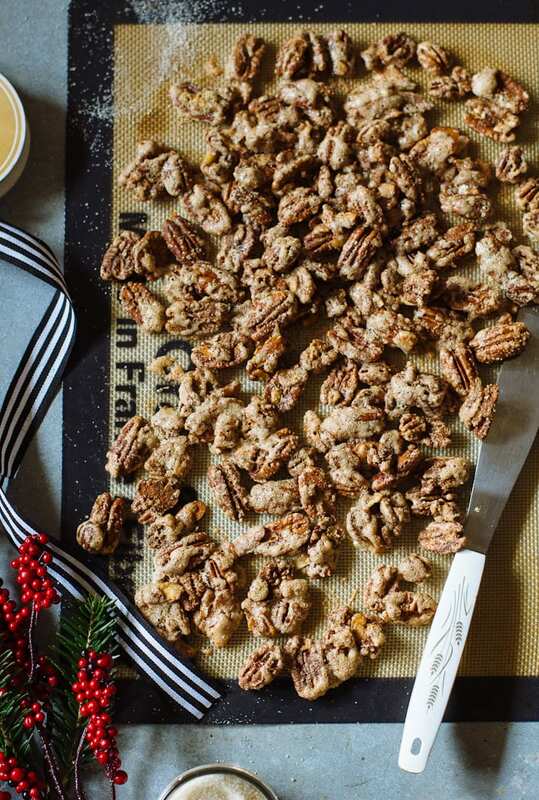 Take that sugary, brittly-goodness and encase it around warm, cinnamon-spiced pecans. And it’s one of the easiest holiday gifts you can make-ahead. Spiced nuts are nothing new, in fact, there are plenty of great recipes you can peruse out there. However, in order to achieve that classic brûléed crust this recipe focuses on a specific formula. Sounds technical, but don’t worry- it’s easy. Remember those cookies dough logs I made recently? They are made with egg yolks only. Not wanting to waste the egg whites, I froze them (individually) in little containers until ready to use. Even if you don’t cook with egg whites that often, and think saving them is useless, they are essential for making this recipe. Egg whites are the secret ingredient. When whisked properly with the right amount of air and sugar, the egg whites will puff up and create a crispy crust (sans the mini blow torch). If you dump all of the ingredients into a bowl and mix it around, it won’t work. The egg whites must be aerated first. Plus, something magical happens when the sugar goes in last. Otherwise no puffy crust for you! If you ignore the ratio and add more than 3 cups of nuts to one only egg white, your puffy crust will be average (like Grade B). It’s not hard. I promise. 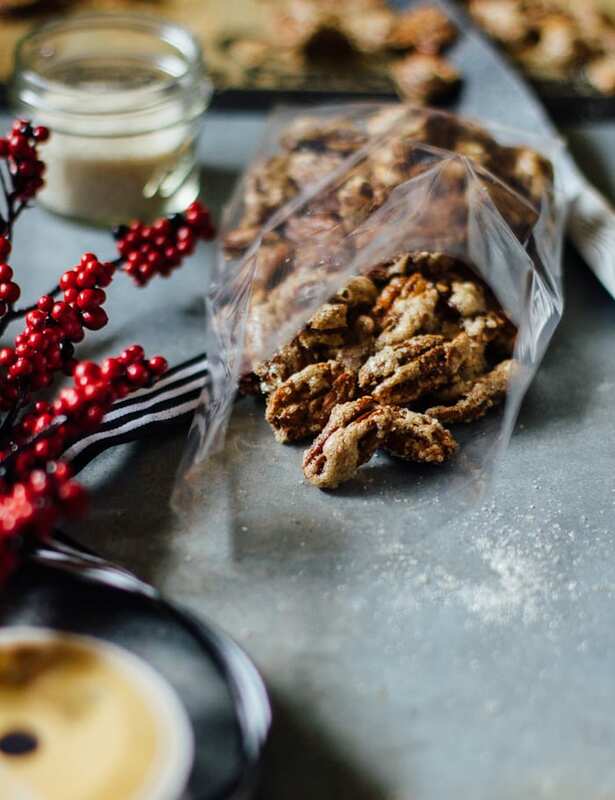 And if you don’t eat all of these irresistable pecans yourself, package them in pretty treat bags with decorative ribbon. Give as gifts to teachers, friends, stocking stuffers- or bring them to your next holiday party for the host. Make up to 1 week in advance. Egg whites can be frozen in small containers or ice cube trays, up to 3 months. Pecans usually go on sale around the holidays. I bought a huge bag at Costco. You can find treat bags and decorative supplies at Michael’s or any craft store. This recipe make about 3 bags. If you want to double this recipe for more gifts, prepare each batch of nuts separately and use 2 rimmed baking sheets. 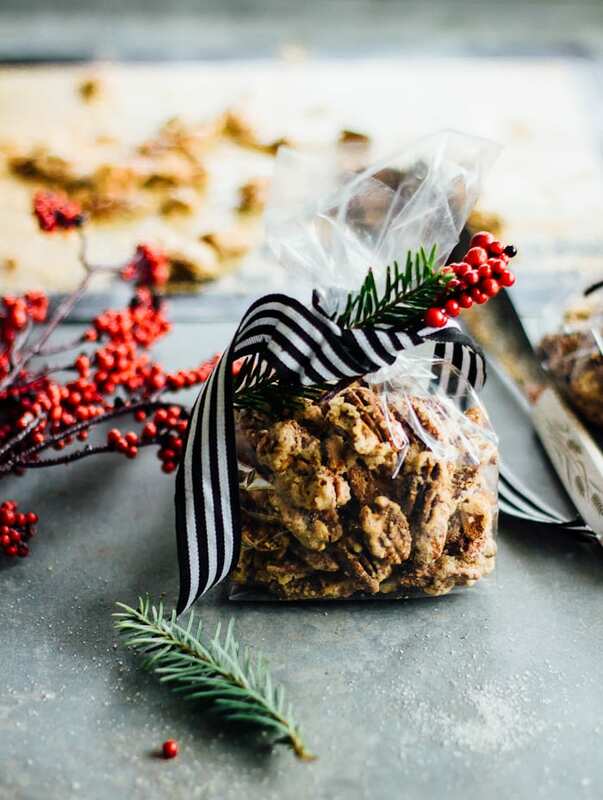 This recipe yields about 3 cups of pecans (for treat bags, use 1 heaped cup/bag = 3 gifts). To double this recipe, prepare each batch of nuts separately (not in 1 giant bowl) and use 2 rimmed baking sheets. Preheat your oven to 325 F. Line a rimmed baking sheet with a silicon mat. *See note below. In a large bowl, whisk the egg white, vanilla, and salt until bubbly and frothy, about 20-25 seconds. Quick tip- aerating the egg whites will help to achieve a puffed sugar crust around the nuts. Add the pecans to the egg white mixture. Toss well to coat. In a separate small bowl, combine the sugar and cinnamon. Pour over the wet pecans. Toss 2-3 times to coat. Using a slotted spoon, spread the nuts evenly onto your baking sheet. Make sure the nuts are not piled on top of each other. Bake for about 15- 20 minutes. You'll know the pecans are ready when the crust is dry, puffed and light golden in color. The nuts will continue to harden once removed from the oven. Do not be tempted to over bake- they will become too dark. Remove the baking tray from the oven and cool for about 10-15 minutes. Once completely cool, transfer to an airtight container or package in treat bags. I was wondering what you were going to make with those egg white. You are a genius my friend. :) These bruleed pecans look incredible. PS: I made your shortbread cookies yesterday. I’ll be baking them in a couple of hours. Cheers! They are absolutely good looking and bruleed pecans, I’ll take the whole sack. How very creative Emilie. So many good tips. Honestly haven’t made nuts with egg whites before, I’m thinking it should be amazingly crispy and perfect. I have a bunch of egg whites sitting, might try it out soon. Love pecans and pecan anything. I love this idea, and I bet I know a ton of people who would love these for a gift. I love the way you wrapped them up. What a pretty gift to get and give! Interesting take on pecans. I love that you call it bruleed and of course the pretty packaging. We love spiced and sweet nuts, and I make them all the time. I love experimenting with various spices, and I’m with you on your egg white directions. The aeration make all the difference in the world. Buon natale a te! These look amazing and I really appreciate all the tips, really helpful! I have been missing the ginger spiced cashews I used to get at my farmers market since the vendor stopped coming and have been working on creating my own version, I’m going to try your egg white technique with the recipe I’ve been toying with, fingers crossed…Thanks so much for the great inspiration! Your recipe is in today’s newsletter from the Pearl Farmers’ Market here in San Antonio. That’s how I found your blog. Wonderful recipes! Merry Christmas.